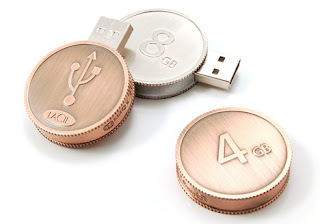 This sleek metal die-cast USB flash drive comes courtesy of a collaboration between LaCie and 5.5 Designers. 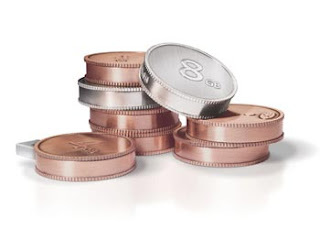 Shaped like a coin, the USB connector is revealed when you twist the device. It offers universal compatibility and cross-platform convenience (usable on both Mac and PC and is backward compatible with USB 1.1.) The only complaint I have about this nifty USB is that I can foresee the disk taking up the surrounding space effectively hogging two USB slots. Comes in bronze (4GB) and silver (8GB). Just don’t spend it by mistake. So cute. My inner geek girl is drooling.